Age appropriateness: "The Age of Stupid" is a British-made documentary film that is not officially rated in the United States. It is safe for viewing by students of all ages; its content is most appropriate for students in grades 5 and up. Accuracy: This acclaimed documentary film is based on the research and views of the vast majority of the world's scientific community. The bulk of this movie is news and interview footage from 2008, when "The Age of Stupid" was filmed. The fictional element features Pete Postlethwaite (1946-2011) as a post-apocalyptic archivist of 2055 viewing this footage, sadly trying to understand why the world's peoples knowingly allowed climate change to continue, let alone worsen. 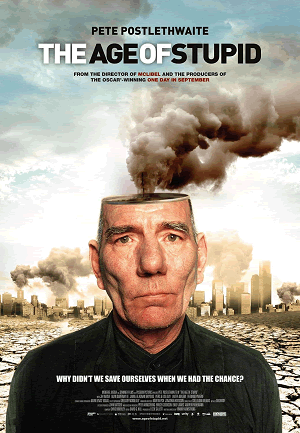 Review: "The Age of Stupid" is one of a large number of 21st-century documentary films sounding the alarm bell for climate change. It is well made, and the inclusion of Pete Postlethwaite as a future archivist looking back on this time period gives the film an entertaining edge lacking in similar documentaries. From an educative standpoint, "The Age of Stupid" largely preaches to the choir. While it can do much to motivate semi-informed students to limit their consumption, less-informed students may find themselves lost. For example, students without background knowledge of India's History and position as a developing country will have a hard time understanding why the filmmakers are fearful of such a populous country increasing its consumption of air travel. Likewise, students unfamiliar with glaciers and the fact that global warming has resulted in their shrinking will have trouble understanding mountain-climbing scenes. In short, background knowledge and educational purpose--not student age--are the primary factors teachers and parents must consider when deciding whether or not to have kids watch this movie. Miscellaneous: You can watch the official trailer on YouTube here. You can watch the film for free here. Visit: notstupid.org. Click here to enlarge the official movie poster. Movie Review Publication Date for Citation Purposes: May 28, 2013.